Andy Hamilton 95% Tungsten original dartset, incl 95% tungsten silver/black titanium coated barrel. 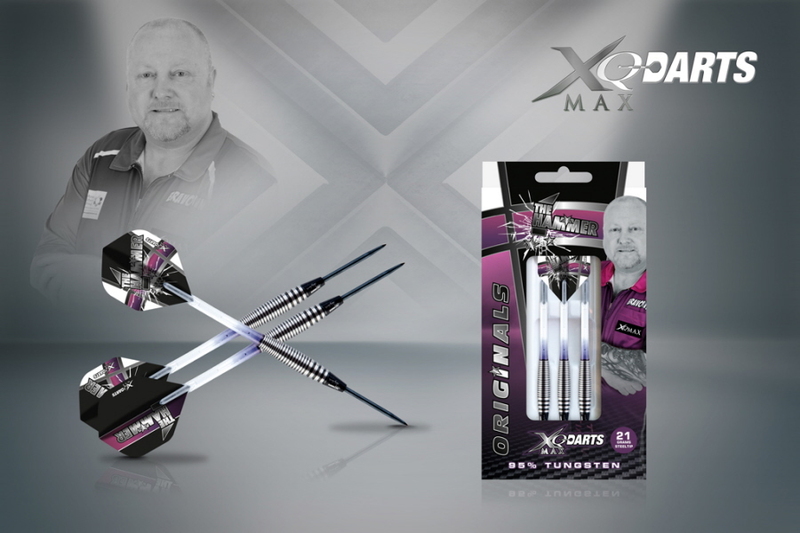 With Andy Hamilton and XQ Max Darts logo, black/clear titanium shafts with rings and flights with The Hammer logo. Originale ones where he plays with. Michael van Gerwen dartset. 3 pcs incl: 20gr brass barrel nickel coated with black grooves and 1 red groove steeltip. Nylon shaft, 100 micron polyester flight, plastic dart case and clam packed. Michael van Gerwen dartset 3 pcs. Incl: 20gr brass barrels steeltip, nylon black shaft and 100 micron polyester flight black with green MvG logo. Plastic dart case. Clam packed. Michael van Gerwen Green Demolisher 70% Tungsten. Black 70% Tungsten barrel black, crystal line supergrip shafts and black flight with green MvG logo. Barrel with MvG logo and XQMax Darts logo and green lines grip finish black point, extra set of green super grip crystal line shafts. MvG 23 grams 100% brass original. With MvG logo and XQMax Darts logo engraved. Original grip from Michael black shafts and black flights with silver MvG logo and star and XQMax Darts logo original ones where he plays with, clam case. MvG 90% tungsten original With MvG logo and XQMax Darts logo engraved. VvdV 90% tungsten original dartset, 90% tungsten barrel. With Vincent logo and XQMax Darts logo ingraved. New original grip from Vincent with white solide shafts and blue flights with Vincent and XQMax Darts logo. 1 set of MVG darts with his signature laser engraved on the barrel along with some durable stems and a set of his own limited edition dart flights.